As a modern marketer, you’re always looking for ways to improve your efficiency at work, especially in the form of software that makes some part of your job easier. You’ve likely heard a lot lately about AI in marketing and how it promises to do just that – and more, of course. In fact, it’s pretty hard to avoid the topic of AI and all the ways it is destined to change marketing as we know it. You may already know that companies who have adopted AI boast about the results: increased conversions, engagement, and a host of other metrics. With such decisive evidence, everybody must be aware of AI and clearly sees its business potential, right? Well, she’s right about one thing. You’re not a data scientist, but what your CMO doesn’t know is that you don’t need to be one. AI-powered marketing makes it possible to leave the data aggregation and deep analysis to the machine and empowers the human marketer to make strategic choices about the best ways to act on the data. With so many AI solutions already available, and all the ways we can benefit from them publicly known, why does your CMO still resist adoption? And what can you do about it? We’ve seen the rise of this technology for some time now, so why isn’t everyone ready for AI? Emarsys commissioned Forrester Consulting to conduct a survey of 717 business leaders and decision makers on how ready they are to take on AI. 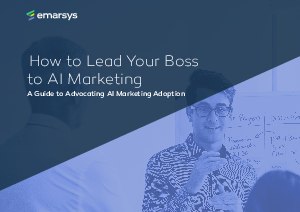 Based on that study, this guide addresses misconceptions about the technology and offers advice on how to approach your VPs and C-level leaders to recommend AI and all the ways it will revolutionize your marketing efforts.